Ahhh, Dunkin’ Donuts Munchkins. Bite-sized, sugary balls of deep-fried dough in almost as many flavors as their ring-shaped mothers. The curse of every Pinoy classroom potluck Christmas party. Don’t get me wrong. I loved Munchkins. I used to mindlessly pop those into my mouth back when, that almost mythical back when, my metabolism was a furnace. I loved Munchkins. Just not when it would seem that half of the moms in class collectively went fuqit-let’s-go-cheap-on-your-classmates. And, boy, could those Munchkin-bearers dig into the real meal items. Deep-seated, unresolved issues from my childhood aside, it is quite notable that the former “pasalubong ng bayan” is still alive and twitching through heavy reliance on nostalgia, mass market appeal, static pricing and strategic airport boarding lounge outlets. A recent spate of aggressive marketing efforts in the face of the influx of more relevant international players coupled with some surprising new flavors brings the Double D’s back from the brink of relative obscurity. I rolled my eyes at the box of Munchkins sitting squarely on the kitchen table knowing my mother, Jurassic Carb-ivore that she is, bought those for herself on pretense that my little cousin next door loves them. When no one was looking, I peeked in to see if it had my guilty, little indulgences called Choco Butternut. What I thought was one distinctly had a deep red color under the fluorescent light. 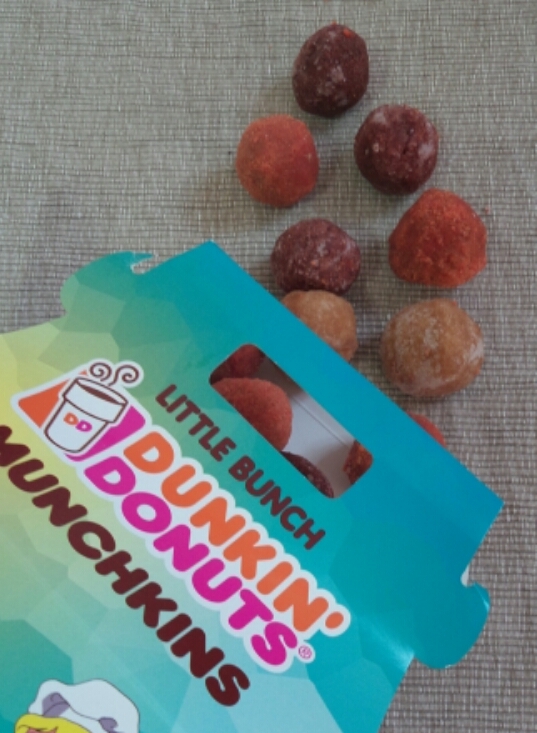 Red Velvet Munchkins?! Aaammmbbbrrrooosssiiiaaa! Well, no. Not even remotely of immortality-granting qualities but quite the novelty, still. I’m just that excitable. It tasted more like a red-colored plain with nary a hint of the chocolate you would have from a standard Red Velvet anything. But, hey. It’s a Munchkin. It was never designed to spark revolution. Pop one in your mouth, chase it with milk then break straight into a haunting rendition of how Justin Bieber would probably sing the late Michael Jackson’s Have You Seen My Childhood. “Pasalubong ng Bayan”, directly translated means souvenir of the country, actually means: what everyone buys as a take home item. Dunkin’ Donuts outlets are well-distributed all over the islands. I think I even saw one on Boracay. Donuts on the beach. Woohoo. Now we’ll all have to pull a Hasselhoff. This entry was posted in Uncategorized and tagged cebu, donuts, Donuts Munchkins, Dunkin Donuts, Food, foodporn cebu, hamburgero, Munchkins, Red Velvet. Bookmark the permalink.